A Swan in Deep Slumber 🙂 This picture was taken during one of my walks near a lake. This entry was posted on May 15, 2008 by IdliDosa. 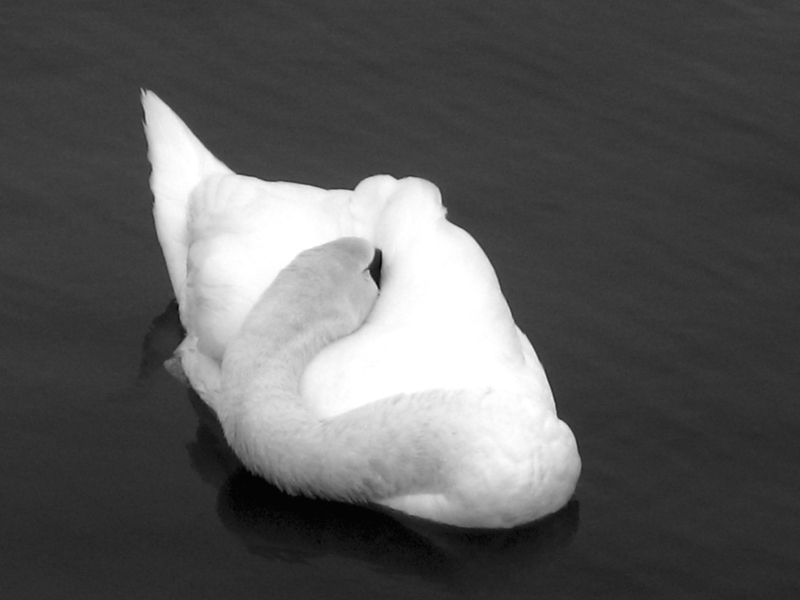 It was filed under Birds, Black and White Photography, Lakes, Walks and was tagged with Black and White Photography, Lakes, monotone theme, photo, photo blog, photo blogging, photography, picture, swan, Walks, wordpress photo blog. Congrats on your new photo blog! I love the swan photo. It really works in black and white! I just started a phot blog myself last week at shutterbugschink.wordpress.com. Check it out! You also might want to check out the Shutter Sisters website at shuttersister.com. I found it surfing recently and it inspired me to start posting a picture a day. Happy shooting! Debbie. Thanks so much. First comment in my blog. Really encouraing. Sad that I cannot add your blog onto my blog roll. Don’t know why this new theme is not letting me add widgets I tried opening the site too…but it wouldn’t open. Do you knw why? As far as I know this theme has no sidebars or widgets, so no blogrolling. It’s just how the theme was constructed. I post all my external references as links in my posts, but it’s not quite the same. I assume as the theme’s popularity grows, so will its capabilities. As for not being able to open the site: my experience is that you can preview the site but you won’t see the color the theme is selecting until you publish. I’v enot had any trouble visiting the site myself (mine or yours), so I can’t help there. Oh…the problem is mine. Try shuttersisterS.com (with an ‘s’) and it should work like a charm. Sorry about that! Hey, great pictures there. I LOVE pics in black n white. They somehow always seem more beautiful, more tragic, more . . . everything!